In November of that year, on the personal invitation of the former Prime Minister, Mahasi Sayadaw came down form Shwebo and Sagaing to the Sasana Yeiktha (Meditation Center) at Rangoon, accompanied by two senior Sayadaws. Thus began twenty-nine years ago, Mahasi Sayadaw's spiritual headship and direction of the Sasana Yeiktha at Rangoon (then in its initial stages of development without many appurtenances that grace it today). On 4th December 1949, Mahasi Sayadaw personally inducted the very first batch of 25 yogis into the practice of vipassana meditation. As the yogis grew in numbers later on, it became too strenuous for the Sayadaw himself to give the whole of the initiation talk. From July 1951 the talk was tape-recorded and played back to each new batch of yogis with a few introductory words by the Sayadaw. Within a few years of the establishment of the principal Sasana Yeiktha at Rangoon, similar meditation centers sprang up in many parts of the country with Mahasi-trained members of the Sangha as meditation teachers. These centers were not confined to Burma alone, but extended to neighboring Theravada contries like Thailand and Sri Lanka. A few such centers also grew up in Cambodia and India. According to a 1972 census, the total number of yogis trained at all these centers (both in Burma and aboard) had passed the figure of seven hundred thousand. In recognition of his distinguished scholarship and spiritual attainments, Mahasi Sayadaw was honored in 1952 by the then President of the Union of Burma with the prestigious title of Agga Maha-Pandita (the Exaltedly Wise One). A significant result of the Sixth Buddhist Council was the revival of interest in Theravada Buddhism among Mahayana Buddhists. In the year 1955 while the Council was in progress, twelve Japanese monks and a Japanese laywoman arrived in Burma to study Theravada Buddhism. The monks were initiated into the Theravada Buddhist Sangha as samaneras (novitiates) while the laywoman was made a Buddhist nun. Next, in July 1957, at the instance of the Buddhist Association of Moji on the island of Kyushu in Japan, the Buddha Sasana Council of Burma sent a Theravada Buddhist mission in which Mahasi Sayadaw was one of the leading representatives of the Burmese Sangha. In February 1954, a visitor to the Sasana Yeiktha would be struck by the spectacle of a young Chinese practicing vipassana meditation. The yogi in question was a young Chinese Buddhist teacher from Indonesia by the name of Bung An who had become interested in this kind of Buddhist meditation. Under the guidance and instructions of Mahasi Sayadaw and of the late Sayadaw U Nanuttara, Mr. Bung An made such excellent progress in about a month's time that Mahasi Sayadaw himself gave him a detailed talk on the progress of insight. Later he was ordained a bhikkhu and named Ashin Jinarakkhita. Mahasi Sayadaw himself acted as his spiritual preceptor. After his return as a Buddhist monk to his native Indonesia to launch a Theravada Buddhist movement in that country a request was received by the Buddha Sasana Council to send a Burmese Buddhist monk to promote further missionary work in Indonesia. It was decided that Mahasi Sayadaw himself, as the preceptor and mentor of Ashin Jina-rakkhita, should go. 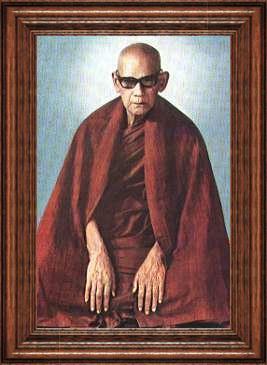 Along with 13 other monks from other Theravada countries, Mahasi Sayadaw undertook such essential missionary activities as consecrating sima's (ordinating boundary), ordaining bhikkhus, initiating samaneras (novices in the Buddhist Sangha) and giving discourses on Buddha Dhamma, particularly talks on vipassana meditation. As early as the year 1952, Mahasi Sayadaw at the request of the Minister in charge of Sangha Affairs of Thailand, had sent Sayadaws U Asabha and U Indavamsa to promote the practice of satipatthana vipassana meditation in that country. Thanks to the efforts of these two Sayadaws, Mahasi Sayadaw's method of satipatthana vipassana meditation gained wide currency in Thailand where many meditation centers had come into existence by about the year 1960 and the number of trained yogis had exceeded the hundred thousandth mark. On the exhortation of Abhidhaja-maharattha-guru Masoeyein Sayadaw who headed the Sanghanayaka Executive Board at the Sixth Buddhist Council, Mahasi Sayadaw had undertaken to teach regularly Ven. Buddhaghosa's Visuddhi-megga Atthakatha and Ven. Dhammapala's Visudhi-megga Mahatika to his Sangha associates at the Sasana Yeiktha. These two commentarial works of the Theravada School deal in the main with Buddhist meditational theory and practice, though they also offer useful explanation of important doctrinal points in Buddha-vada. They are thus of the utmost importance for those who are going to be meditation teachers. In pursuance of his undertaking, Mahasi Sayadaw began teaching these two works on 2nd February 1961 and for one and one-half to two hours a day. On the basis of notes of his lectures taken by his pupils, Mahasi Sayadaw started writing his nissaya translation of Visudhi-megga Mahatika and completed it on 4th February 1966. The production of this nissaya translation was an exceptional performance on the part of Mahasi Sayadaw. The section on samayantara (different views held by other religions or faiths) formed the most exacting part of the Sayadaw's task in producing this work. For tackling this part, the Sayadaw had to, among other things, familiarize himself with ancient Hindu philosophical doctrines and terminology by studying all available references, including works in Sanskrit and English.